Just when you thought that ‘EDM’ couldn’t get any more vile, corrupt and mind bogglingly shameless than Paris Hilton’s Ibiza residency – Deadmau5, perhaps the epitome of everything that is wrong with that acronym has made a fresh bid for the top spot. In case you (mercifully) don’t know what EDM is, it is what the Americans call dance music, (Electronic Dance Music). It’s not as simple as which moniker you prefer though. It has come to represent the systematic corporatisation of dance music and unimaginable levels of crass commercialism and gullible youth. The likes of David Guetta, Steve Aoki, Tiesto, Afrojack and Deadmau5 began selling out stadiums in the US to a demographic who 10 years ago would have been at a soft rock concert. Not only did they produce endless streams of music that sounded like the cast of an Icelandic children’s TV programme had discovered LSD’s evil chemical twin and made a song under its influence for a hyperactive US megamall with mother issues, they managed to virtually end DJing altogether. They, and the people who allow them to get away with it, do not actually play live – they press play on a pre-recorded set, twiddle the occasional knob theatrically make heart shapes with their hands, fist pump the air like a sexually confused aerobics instructor and let an expensive light show pre synchronised to the recording justify astronomical fees and ticket prices. If you actually think about it, it’s right up there with the banking sector in the surreal stakes. But while David Guetta is just a photoshopped smile and a healthy reservoir of hairspray, Deadmau5 is a deeply unpleasant little man. Not content with cynically reducing dance music to the play button and a ridiculous mouse mask, he goes out of his way to be offensive, suggesting any idiot can DJ (something he doesn’t actually seem to able to do having mixed up computer technology and a mouse mask with actual mixing skills, charisma and the instincts to both guide and follow a crowd) and generally being rude and dismissive wherever possible. Currently playing a Las Vegas residency which will reportedly earn him $ 20 million over 2 years, he is now embroiled in a series of lawsuits – amazingly enough none of which actually affect him directly. Deadmau5’s real name is Joel Zimmerman (apparently – it may be a Dylan reference – who’s real name was Bob Zimmerman). His agent is ALSO apparently named Joel Zimmerman. Agent Zimmerman was chatting to Jesse Waits, the owner of XS (the club in which Bloke With Stupid Mouse Head Zimmerman is playing his residency). Waits introduces him to high roller Don Johnson (no – not that one – this one didn’t do Miami Vice, he became famous as ‘The Man Who Broke Atlantic City’). Johnson offered Deadmau5 $200,000 to play Bon Jovi’s “Livin’ On A Prayer” during his set. That sentence alone speaks volumes about what the Americans have done to dance music culture. Anyway. 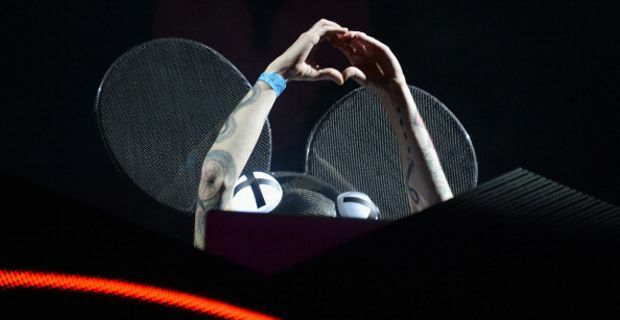 Deadmau5 obliges (he must have tacked it onto the end of the pre-recorded set and downloaded it while he was pretending to play), but when someone was sent to collect the cash – Mr Johnson was less than forthcoming. Agent Zimmerman works for a company called William Morris Endeavor and the company was so fearful of breaking the news to Deadmau5 that it offered to cover $150,000 if Waits, the club owner would stump up $50,000. Instead, he got paid, and then Waits decided to sue Agent Zimmerman claiming the $50,000 was a loan, rather than a definite payment to the artist. WME and the agent are now countersuing, claiming ‘negligent misrepresentation’ as they should have known Johnson would never pay.